: 113 à 128 cm. 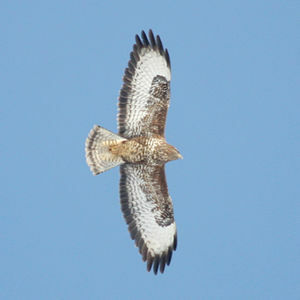 The Common Buzzard exists in France in the wild. It's a nesting and migratory protected species. 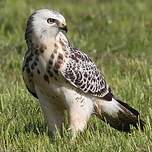 It's also Central Europe's most common bird of prey. It has a compact stature, with a round head and a rather short tail. 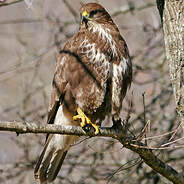 Its plumage shows variable colours, generally dark brown with white spotted underparts. Beak is hooked from the base. Sexes are identical, but females are slightly larger than males. 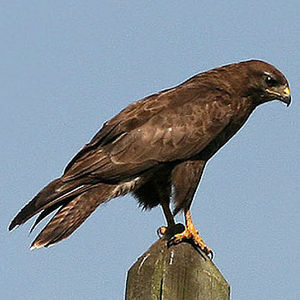 Generally, older subjects are much darker, showing nearly white underparts with brown stripes turning to reddish-brown on the abdomen. Primary feathers are dark, close to black. Tail is short and wide. Eyes are brownish yellow. Beak is dark and cere is yellow. Feet and claws are yellow. Immatures are very similar to adults, except that their head shows white or yellowish stripes. Wings and back feathers edges are sharp and reddish-brown. Tail has practically never the wide terminal stripe. Eyes are grey but change quickly. Cere and feet are yellow and the beak is blackish. They get their adult plumage at 16 months. 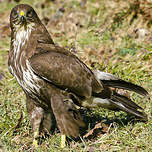 The Common Buzzard cheeps. Its call sounds like a high-pitched miaowing, often repeated when bird has landed, and faster when it flies. This call is perceptible at long distance and reveals its presence. During breeding time, the female communicates with the male with the same call, and often, one's can hear long duets performed by the two adults. During autumn, when families fly in flocks, the same call is performed by adults and juveniles. When in the nest, calls are raucous and sound like chuckling. All types of woodlands, from smallest field bushes to alluvial forests. Found also locally in marshes and rocky coasts. always close to an open space. It is also found in places where trees are scattered, in agricultural zones and in rocky areas in the mountains. 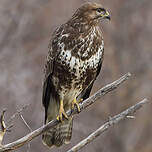 The Common Buzzard breeds in whole Europe, except in Scandinavia's far north, Iceland and a part of Ireland. 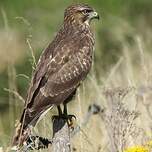 Common Buzzards living in Northern Europa migrate to France in winter. 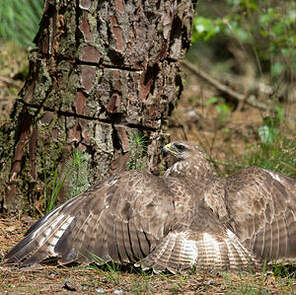 The Common Buzzard is often considered as a lazy bird. It might look lazy when seen quietly perched for a long time, but, in fact, it's a very active bird, flying back and forth above fields and forests. 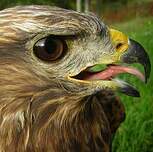 The Common Buzzard eats small mammals caught on the ground, but also birds, reptiles, batrachians and insects. This species has a great adaptability. 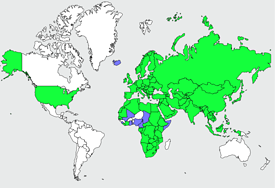 This is perhaps the reason why it has high breeding figures. It is famous for its way of capturing moles. It watches the ground and, at the moment the soil moves, it flies suddenly off its perch and captures the animal without hesitation. 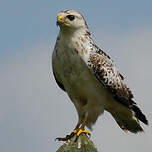 Major part of its preys are captured after having been visually located during low altitude circling flights, but also after searching at an altitude of about 100 meters. 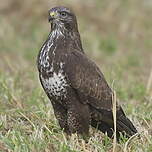 The Common Buzzard has also a keen ear, and can trace a mouse movement in the grass. When the prey is located, the buzzard soars slowly towards the ground, lands, runs quickly with agility and captures its prey. 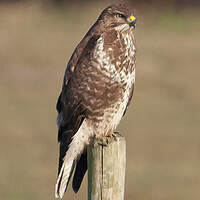 The Common Buzzard is non-migrant and very territorial. Once a pair has chosen its territory, it will remain there for its whole life. Their juveniles break up in the neighbourhood and live in the vacant territories. 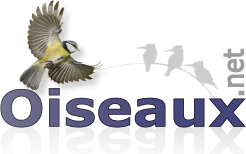 Around mid January, territoriality instinct gets stronger with breeding season's beginning and it's frequent to attend to flying movements and attacks against outsiders of the same species. In February, nuptial flights intensify and continue in March. It involves a series of turns, soarings, and nosedivings, performed by the pair. 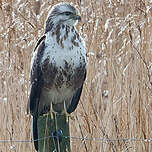 If the Common Buzzard is baited by crows or seagulls, it turns over on it's back while flying and claws the nuisance. 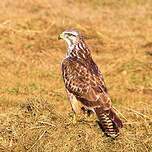 Common Buzzards can be easily recognisable by their figure when they soar in circle for hours. Wide extended wings, slightly put up, and a wide rounded tail. Neck is very short. Flight is quite heavy, sometimes stationary. 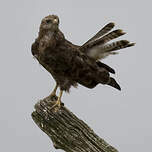 The Common Buzzard starts its flight slowly and on a heavy way, but when reaching a certain altitude, it soars slowly and spirals upwards easily. Once its altitude is reached , it flaps its wings and flies away in a direct flight to the woods or it continues to climb to a higher altitude. 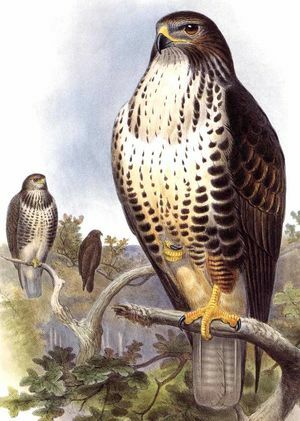 If air streams are very strong, it folds its wings and swoops down at high speed, wings nearly closed and tail tighten up, up to the next perch. Live mainly on very small mammals, rarely leverets, birds, reptiles, batracians, insects, sometimes cereals. 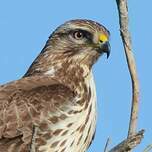 During food shortage, buzzards can feed off carrion. 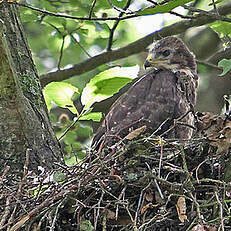 Common Buzzards nest in high trees in forests, plains, mountains and also in rocky areas scrubs. 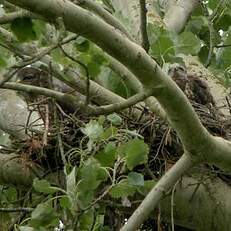 Their nest is built in a broad-leaved tree or in a conifer at a height of 6 to 30 meters. They build it with dry wood branches, roots and twigs. Inside is lined with green leaves taken from trees around. The female lays 3 to 4 eggs at a regular interval of 2 or 3 days. The male replaces the female if she leaves nest occasionally. He brings preys and feeds her during incubation. 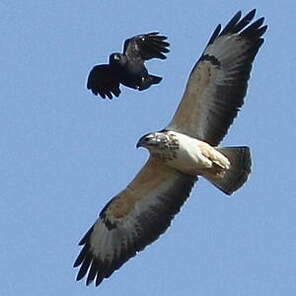 He watches the site by flying permanently over the zone while hunting. Incubation lasts about 35 days up to hatching of the last chick. 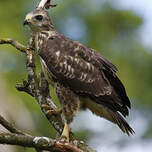 Juveniles are covered with a brownish grey down, with a dark spot around the eyes, and white underparts. Some feathers come out after 12 days. During the first days, chicks present quite different sizes, but the quantity of preys brought by the parents equalises this discrepancy. Nevertheless , there is always a chick that is much smaller than the others and that finishes to be trampled to death by the others. At the age of one month, chicks can eat preys that are brought at the nest. Even after fledging, chicks remain very dependent on the parents until summer, when they break up. It seems that juveniles breed around age of two.